Leslie Armour, serious, scholarly and controversial editor of The Ubyssey, and journalist in Vancouver (The Province) and London, UK, (Reuters and Express News and Features), passed away, aged 83, in Ottawa, on November 1, 2014. Leslie obtained his PhD from the University of London in 1956 under professors C.E.M. Joad and Ruth Saw, and was a Fellow of the Royal Society of Canada. He taught at universities in Canada and the United States, and, at age 65, was named professor emeritus at the University of Ottawa, becoming research professor of philosophy at Ottawa’s Dominican College. He was a lively and witty lecturer and conversationalist. 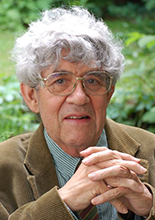 A dedicated writer and teacher, he prepared many of his published works, including nine monographs – three with co-authors, including Elizabeth Trott, through introductory notes for his courses, leaving class times for discussion and understanding. His publications were in three main areas: metaphysics, the theory of knowledge, and the philosophy of religion; moral, social and political philosophy; and Canadian philosophy. Although economics was outside his main field, he was appointed editor of the British International Journal of Social Economics (IJSE) in 2004 and was often in demand as a speaker at international conferences. He reviewed books for the Library Journal, and wrote several hundred papers, reviews, encyclopedia entries, and book chapters. He served on the boards of numerous scholarly associations and journals. A prolific reader, the more than 10,000 books in his library, classical music, and baseball were his life-long passions. Leslie is survived by his wife, Diana; his children, Carol Aronson, Adriane and Julian Armour; seven grandchildren; and his sister, Elspeth Richmond.